Fun facts: The mother of six says her philosophy is to take one day at a time. One of those days, she'd like to visit her uncle in Germany. 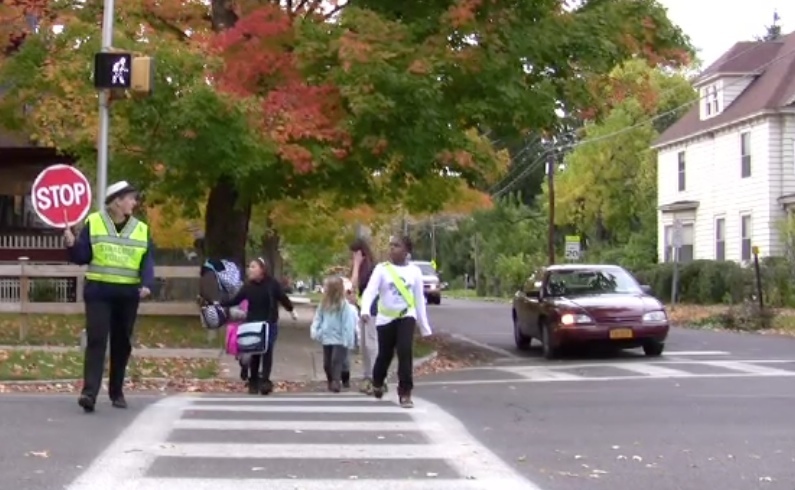 Debbie Anderson has six kids of her own, so her work as a crossing guard has special meaning. Data points: There are 71 languages spoken in city schools, according to the city school district. Providing meals is a big service: breakfasts served daily 7,300; lunches served daily 14,200. Total public school students transported daily: 9,558. The South Side of Syracuse is a community of some 20,000 people looking for a fresh start. It is high on spirit — but a little low on resources. If you are not familiar with the South Side, you can look to a major construction project in the 1960s as a start for your primer. According to a 2003 article in the local newspaper, The Post-Standard, then-Syracuse Mayor William F. Walsh used funds from a federal “urban renewal” program to run the path of Interstate 81 through the city, and also make room for Upstate University Hospital and a brand-new police headquarters. The developments displaced nearly 1,300 residents from the old 15th Ward, a predominantly African-American community. 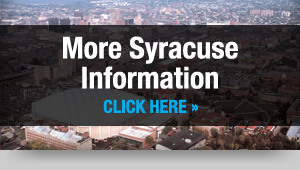 As a result, the once-vibrant and close-knit community was divided, and separated from the Syracuse University campus. According to Atkins, the relocation of 15th Ward residents caused wealthy, largely white families to move out as their new neighbors moved in. Nearly 50 years later, the South Side is still recovering. Despite the efforts of many nonprofit organizations, some of the needs of the South Side residents and businesses outnumber the resources available. “We’ve seen a need. But do we get our fair share of taxpayer dollars? Absolutely not,” said Walt Dixie, director of Time of Jubilee, a nonprofit corporation that builds affordable housing. Dixie said since the corporation was formed in 1987, Time of Jubilee has helped build more than 90 houses on the South Side. And as the needs of the community have evolved, so have the programs Time of Jubilee and other nonprofit organizations offer. The area, a 1-square-mile section of the South Side called the South Salina Trade Area, is bounded by Adams Street on the north, Brighton Avenue on the south, Midland Avenue on the west and I-81 on the east. 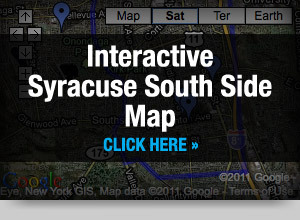 In 2006, the city of Syracuse designed the South East GATEWAY Neighborhood Design Plan — designed to create accessible retail on the South Side. “It was a model of what the area should be like, and what the South Side can be if we show interest,” Robinson said. But despite the proof of potential in the area, Robinson said developers he has spoken to aren’t following through with the GATEWAY plan. “That day will come and I think what we have to do is be creative and we can make some good things happen on the South Side and make a person proud to be called a South Sider,” Robinson said. Even though her six children are grown and gone, Debbie Anderson continues to volunteer at the elementary school they attended. For more than 10 years, she has helped train student crossing guards at Meachem Elementary School in Syracuse. Every morning and afternoon, Anderson works with the students, teaching them the rules of the road and how to keep people safe. Very interesting, seems very logical and impressive article. Every society need people like Debbie. Such an essay does not require one to be realistic at all. One should build as many castles in the air as he possibly can to write an interesting essay of this kind http://www.buyanessaycheap.com/. Read more at my blog. This woman is really making a difference. Someone needs to reward her for this service to public. Mrs. Debbie Anderson is a very inspiring person. Year after year she teaches kids safety on the streets. Beautiful! This woman is brilliant. There needs to be more people like her in the world. If I see this woman on the street I will give her a huge applause. True role model citizen! I found this post to be very intellectually stimulating and entertaining. Thank you worldjournalism.syr.edu for this! Definitely going to share this on my Facebook, LinkedIn and other social media accounts. these are the people, we need to follow. Thanks for sharing this beautiful information. Dear Debbie, thanks for doing this great job for our children…you are role model!! wow, great work by debbie…great people!! Really this is very essential to confirm the security on the streets. It can save us from unexpected accidents and i hope people also be aware about this educations. i totally believe that every school need a good role model like Debbie!